Over the years, the music from the eclectic, circus-shows of CIRQUE DU SOLEIL have, musically speaking, kept pace with the vividness and texture of the performances themselves. 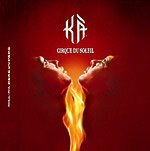 Enter Cirque du Soleil's latest production, KA, composed by Rene Dupere's score for . KA is cleary apart of the Cirque du Soleil soundtrack family. KA along with Varekai, Dralion, The Journey of Man, Allegria, Solarium, Quidam and a host of others share that almost intangible quality that is the end result of CIRQUE DU SOLEIL's musical blend. Keeping with the world-beat meets Hindi meets chill-out of many of it's predecessors personality, KA does manage to forge a place for itself in much the same way The Journey of Man did - its feature of a symphony orchestra. There are, of course, memorable, vocal tracks such as: "O Makunde," which serves as the KA's main theme, "Koudamere," and "Fores" - all of which are constructed with light, chill-out, rhythms and synthesized instrumentation. Interspersed are truly dramatic pieces like "Storm," "Pursuit," and "Battlefield." Such pieces are more reminscent of modern-day film (or even video game) scores and yet have enough personality to keep from falling into the "canned music trap" and maintain the listener's undivided attention. Lastly, Rene Dupere's KA interjects some moments of wonderous beauty. "Deep," "Shadowplay," and "Flight" all offer rapturous melodies which help round out this soundtrack release. If you are looking for a little audio-diversion this Autumn, CIRQUE DU SOLEIL's KA will certainly do nicely.